Home » Fly Fishing » Did Someone Ask For Fish? Did Someone Ask For Fish? 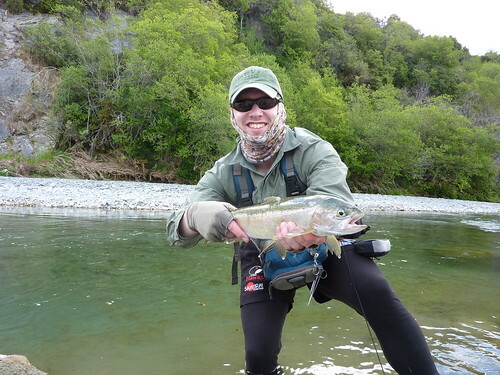 I have just returned from a fantastic week’s fishing. Whilst in the UK, in December one doesn’t ever get the chance to stand in a river when the air temperature is mid twenties, the sun is high in the sky, fish are spottable and they are feeding! 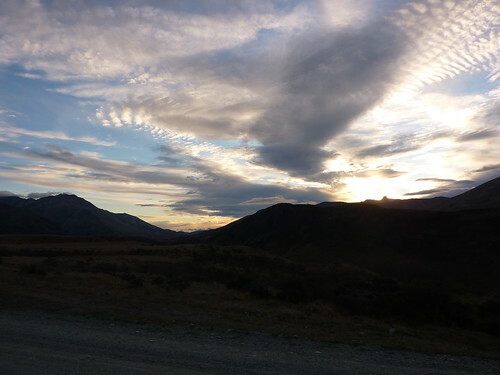 I do love New Zealand! My first night saw me on a small spring creek that Alex recommended to me, unfortunately I arrived in fading light which made spotting really difficult but spooking exceptionally easy. In fact I would say I totally excelled at it actually! My first impression was that the creek gets fished A LOT purely because of the reaction of the trout. My fears were confirmed the next morning when I returned and found 3 anglers on the small creek…. After spooking an impressive number of fish I decided I’d had enough and went to the main river that creek flows into, good decision as I quickly found rising trout and soon had one to hand. Before I continue, I’d like to give a bit of information on spring creeks as it’s something I don’t believe we have at home. At least if we do there can’t be many! 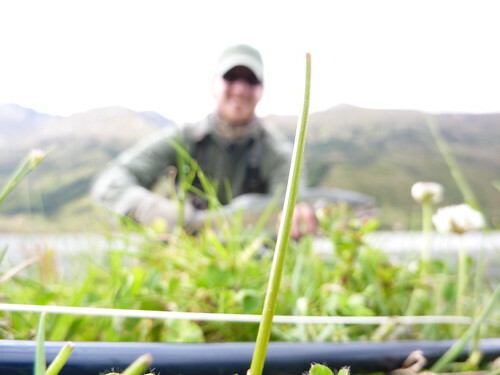 They are formed by water coming from the ground and seem to be very fertile supporting high trout numbers and a LOT of weed. The huge amounts of weed creating a mass ensemble of twisting, spiralling and generally distorting currents. 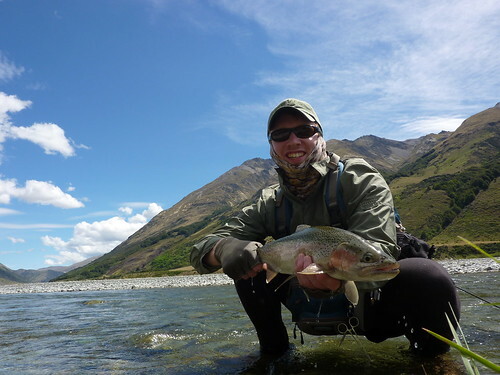 A fly fishers nightmare in terms of combating drag – you must use a very long, fine tippet and collapse it a good bit or you will see drag like you didn’t think possible. Very tricky places indeed but there is a magic about them, the atmosphere they carry is something I cannot explain. 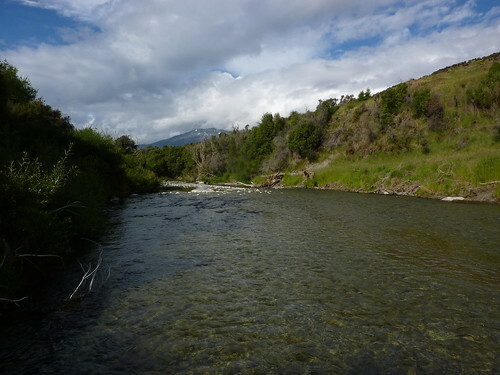 The following day saw me hightail it to a river I had wanted to fish for a while now, I was now doubly motivated after being stuffed by the other anglers on the spring creek! 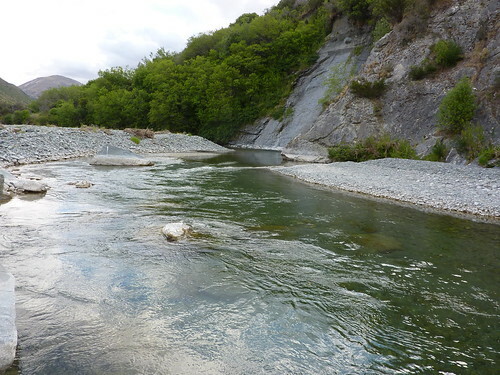 I arrived at the river which at first looked a bit barren and suffering from low water summer conditions however after a quick walk in spotting mode the first trout was spotted, covered and promptly hooked. This continued on for the rest of the day, thankfully using the upstream (for once!) wind. I’ll let the pictures do the talking. 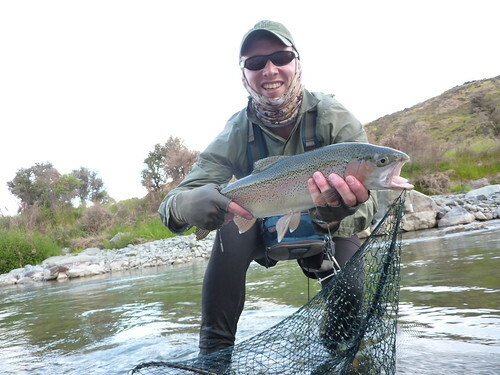 These rainbows were in absolutely immaculate condition and the photographs do not do these fish justice in terms of displaying their colours nor their acrobatic displays after being hooked! The result of the first day was 4 fish landed and 4 or 5 missed/lost. 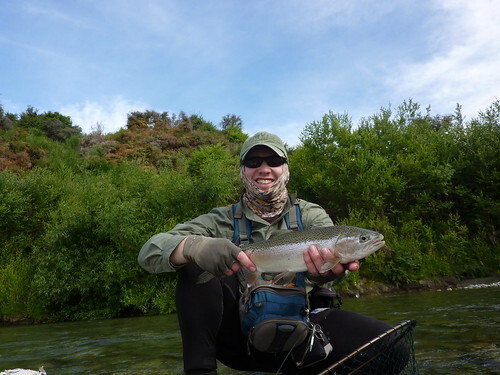 The following day was a return to the same river, this time fishing the upper area of the lower gorge – 3 rainbows were landed this day, again with a few more lost. I don’t have pictures of all the fish, I took some video at various times and will post it once I have it compiled. The day following the two days on this particular river saw me drive further West, partly as I had to go and fill up with Diesel or I wasn’t going anywhere and partly as I wanted to go back and catch an old friend that had eluded me on a previous trip. 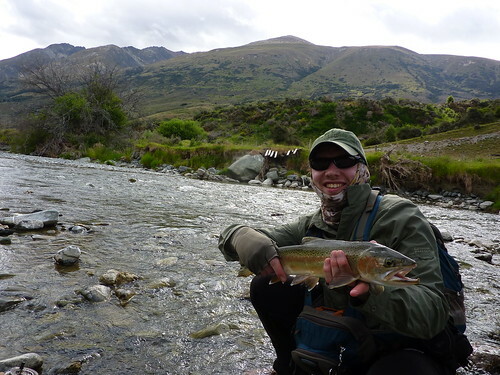 After walking a few kilometres and then following a stream down to the main river; I was greeted by the wonderful sight of a large trout wolfing down flies from the surface. Seeing jaws that sizes coming out from below and taking down the insects really gets your heart going! 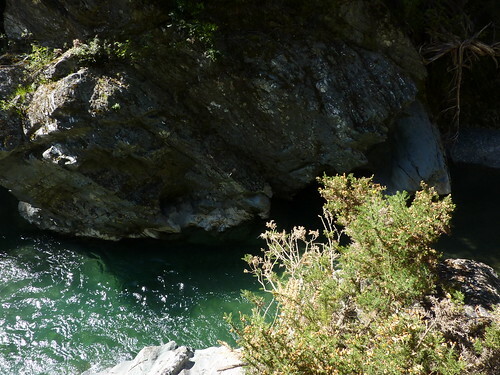 I got down into the bush and crawled down around 20 metres below him, got to the rivers edge and slowly worked my way back up into casting distance. I covered him and first cast over him, the fly came past him and when around a metre passed him he turned and bolted after it, jaws out of the water, Wulff engulfed and I struck into thin air! I was too busy watching the fish I didn’t see the slack line off of my rod tip. Annoying yes but these things happen and it was a pleasure to fool him anyway! Within 5 minutes I had come across the next target, 3 large trout feeding ferociously in a lovely smooth pool where my old friend from last time resides. I covered one of them and he took hold of my wee nymph. 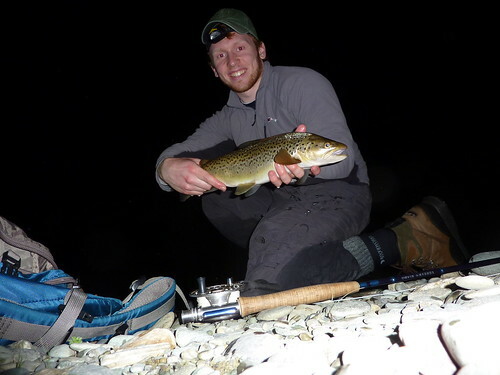 A lovely brown to hand – I don’t know if he is the same fish I spooked previously but I like to think he is! Unfortunately this fish was the end of the action as a gale force wind picked up and the heavens opened, dropping a huge volume of water upon my head! The final day saw a calm morning and just as I set off to the target river with two friends, we were greeted by a strong downstream wind. 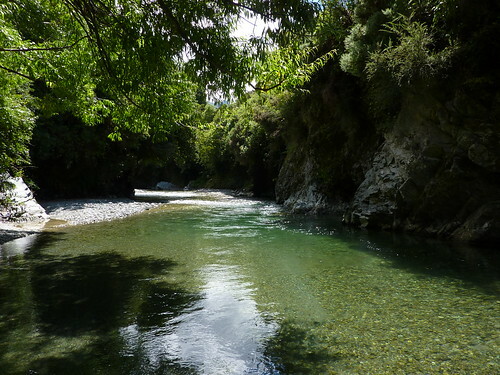 This meant it was back to the river of the rainbows to fish the only section I hadn’t yet fished, the lower inaccessible gorge! With private access to the river mouth negotiated with the local farmer we arrived at the river and started the walk. 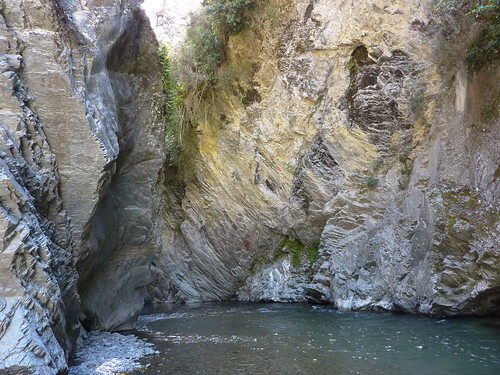 The gorge runs for aruond 2-3kms and involves wading to neck level with bags held above head, rock climbing and swimming. And this was in very low water conditions! It was a great adventure, one I will never forget but spotting conditions were difficult as the sun was not penetrating the water. 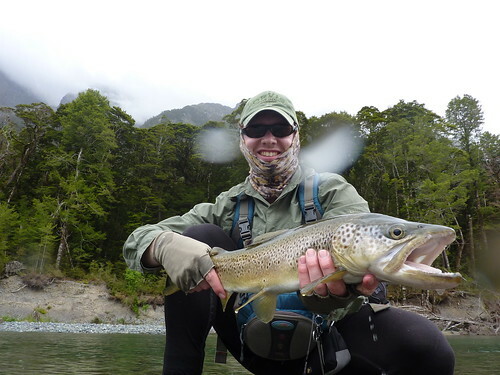 It actually took around 6 hours before I came across a fish that we saw before it saw us – thank the lord it was a successful hookup! It was an excellent trip, a lot of fish, great fishing action. I will hopefully have the videos sorted in the near future and be able to post them up. Merry Christmas to all for now!